Tuesday, March 19: Timberwolves' Karl-Anthony Towns shoots the ball against the Golden State Warriors. 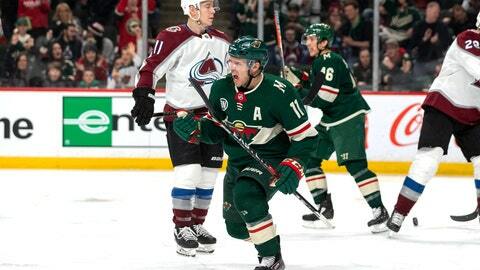 Tuesday, March 19: Wild's Zach Parise celebrates after scoring a goal during the second period against the Colorado Avalanche. 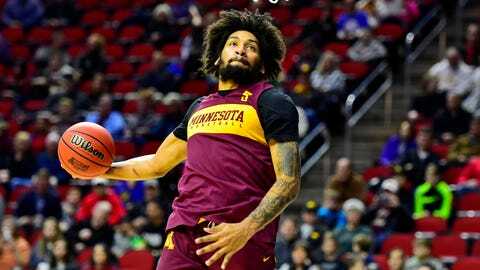 Wednesday, March 20: Minnesota Golden Gophers guard Amir Coffey dunks the ball during practice before the first round of the 2019 NCAA Tournament. 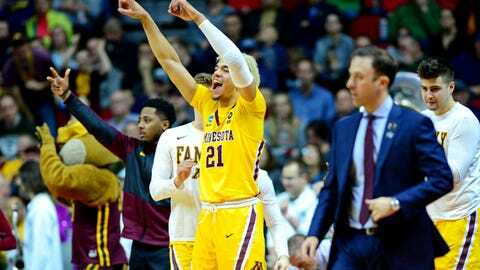 Thursday, March 21: Minnesota forward Jarvis Omersa celebrates on the bench against the Louisville Cardinals in the first round of the 2019 NCAA tournament. 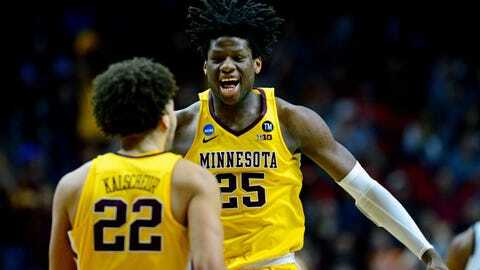 Thursday, March 21: Daniel Oturu celebrates with Gabe Kalscheur during the Gophers' win over Louisville in the first round of the 2019 NCAA tournament. Friday, March 22: Minnesota forward Jordan Greenway celebrates his goal that gave the Wild a 1-0 lead on the Washington Capitals at Capital One Arena. Friday, March 22: Luke Kunin goes bar down in the third period, scoring the game-winning goal in Minnesota’s 2-1 win over Washington. 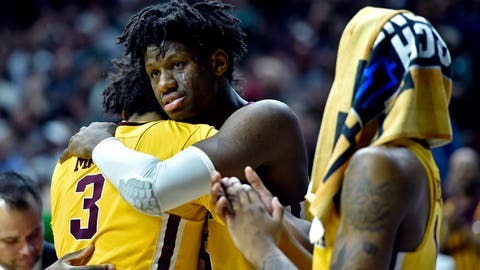 Saturday, March 23: Jordan Murphy hugs Daniel Oturu during the Gophers' loss to the Michigan State Spartans in the second round of the 2019 NCAA tournament. 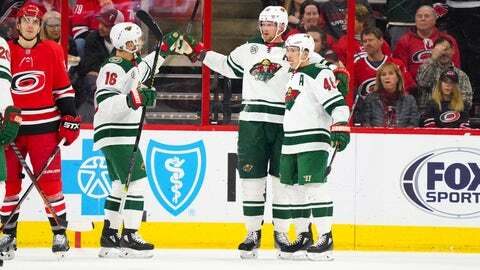 Saturday, March 23: Wild center Eric Staal is congratulated by Jared Spurgeon and Jason Zucker after his second period goal against the Carolina Hurricanes. 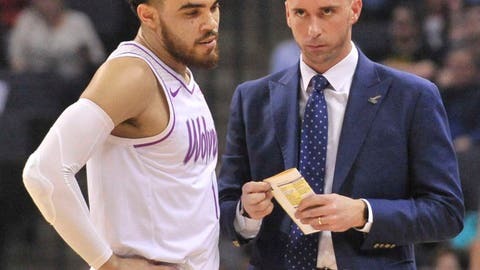 Saturday, March 23: Timberwolves guard Tyus Jones and head coach Ryan Saunders chat during the first half against the Memphis Grizzlies.